We are an online and brick and mortar retailer with 40 plus years of experience. Our focus is on quality products, excellent prices, and outstanding customer service. We want to bring products to people to enhance their lives! You can initiate a return for new and unopened items within 15 days of delivery for a refund. To qualify for a refund, items must be in new and unused condition with all original materials and/or accessories. If a return is not received at our processing facility within 30 days, it may be subject to a partial refund. You will be responsible for return shipping costs. However, if the return is a result of a fulfillment error, product defect, or damage incurred during shipping, we will refund the full cost of the merchandise. We will provide a pre-paid return shipping label for Non-Buyer's Remorse returns. All returns are subject to inspection, and if found not to be an error on our part, the return shipping costs will be withheld from your refund. SPECIAL RETURNS INSTRUCTIONS: The Seller will issue a partial refund up to 20% for used or non-restockable items. 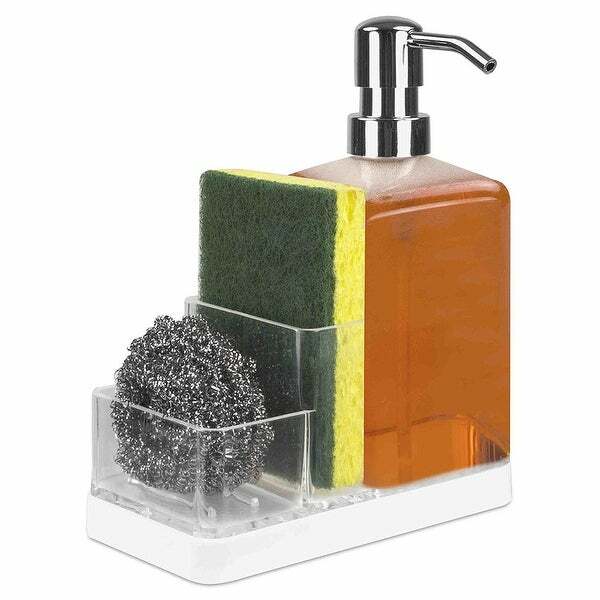 Home Basics soap dispenser and sponge caddy organizer Perfect for the kitchen and bathroom. Three compartments to hold soap, sponges, steel wool, and other cleaning products. Made of high quality plastic. Size: 6.5" x 3" x 8". Dimensions 8.0 In. X 3.0 In. X 7.0 In. Clean look, convenient to hold liquid soap, and other assortments. My sponges don’t really fit nicely though. Very practical. I am pleased with my order, just what I was looking for.